[07:30] SarahKB7 Koskinen: good evening. 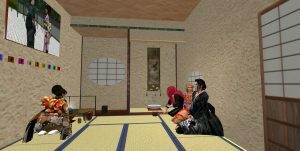 a tea ceremony? [07:33] SarahKB7 Koskinen: 3 sizes sandal? [07:33] SarahKB7 Koskinen: 1. is small? [07:47] SarahKB7 Koskinen: home olympics! [07:47] SarahKB7 Koskinen: when choosing the 2020 host city, I hoped Tokyo would win. [07:48] SarahKB7 Koskinen: to sit? [07:54] SarahKB7 Koskinen: remove ladle now? [07:55] SarahKB7 Koskinen: inappropriate. i’m not a japanese. [08:13] SarahKB7 Koskinen: blue pattern on floor. kitten tennis court? [08:16] SarahKB7 Koskinen: my electric kettle is too simple. [08:18] SarahKB7 Koskinen: it fell? [08:25] SarahKB7 Koskinen: did you call Yana Kawashima? [08:25] SarahKB7 Koskinen: it came already?